Killer Croc spotted in downtown! Just a few days ago, I highlighted the freaky Joker mech blasting through Gotham, and I noted that more dioramas by these collaborators were in the works. Here’s the next, by 6kyubi6. 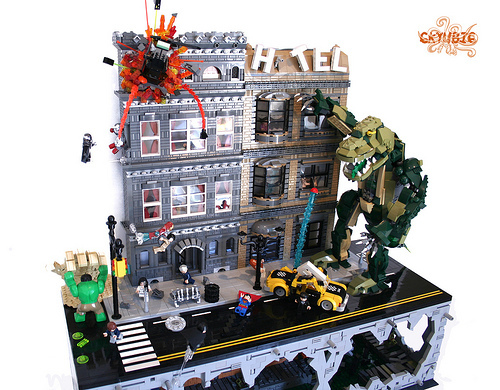 It’s a crazy scene of downtown mayhem as the sewers unleash a truly gigantic mutant Croc. A plethora of superheroes and even a few other villains dot the landscape as the city sustains its fair share of collateral damage. Both scenes will be on display at Briqu’Expo 2013 in Diemoz, France, next month. I love the way Killer Croc’s mecha is a reflection of the Joker’s mecha from the complementary build. I’m so glad I’ll see it in real life ♥ as I’m going to Demioz too, but sadly will not show any moc, as I didn’t did any lately.